Strawberry blonde with a smile as big as her heart, Hallie Sternberg opened the door to the B’Nai Israel Congregation for her mother to walk in. Hallie has spent a lot of time at the B’Nai synagogue for the past few months preparing for her reading of the Torah at her bat mitzvah. Twelve-year-old Hallie is a seventh grader who loves to read and learn about her Jewish heritage. She’s preparing for her bat mitzvah, a common Jewish practice for young girls approaching the age of 13. Bat is understood as daughter and mitzvah as commandment in the Hebrew language. The coming of age that Hallie is approaching will also require her to read from the Torah, or Old Testament, during the service. While Hallie has not been bothered by the reading preparation, she has been learning to read and sing Hebrew with the rabbi for two years. Within Jewish tradition, it is expected for girls to also perform a Tzedakah, commonly known as a charity project, before their bat mitzvah. The charity project expected of Hallie, and all 12-year-old Jewish girls, is a sign of ethical and moral maturity. “I wanted to do something I loved and give that to other kids,” Hallie said, flashing a grin full of braces. Her love of reading easily fueled her charity project. 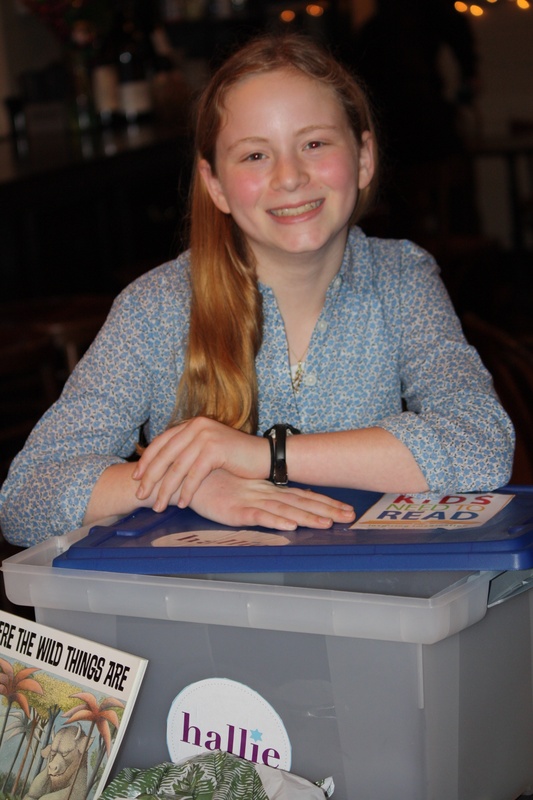 Hallie set a goal to collect 6,000 books before her bat mitzvah on March 22. She began collecting in May 2013 after deciding that she wanted to share her love of reading with others. Hallie and her mother searched for organizations with a literary focus. They found Kids Need to Read in Mesa, Ariz.
“My mom helped me email the executive director with my idea about wanting to collect books for a local elementary school,” Hallie said. The organization partnered with Hallie to collect books and donations for her cause. Hallie chose to give the collected books to Melrose Elementary School in Baton Rouge. This is the first time that Kids Need to Read has been introduced into Baton Rouge, La. Kids Need to Read linked Hallie to a publishing company that will sell books at manufacturer’s cost for the project. Hallie said that $10 would normally buy one or two books, but with the publishing company, $10 will by 10 or more books. Hallie began setting out drop boxes at several locations around Baton Rouge. She started with her own school—Episcopal Middle School— followed by drop boxes at SOHO Boutique Salon, Starmount Life Insurance, B’Nai Israel Congregation and other locations throughout the capital area. Recently, Bistro Byronz on Government Street held a support night for Hallie and Kids Need to Read. The Bistro donated 20 percent of proceeds from each check to the project. Hallie also brought in 50 books and $1,000 worth of checks at the end of the night, her mother said. “It was a good night,” Katherine Sternberg said. Currently, Hallie is only 2,000 books away from her goal of 6,000; however, with the donations received, she may exceed her goal. In May, Hallie and her mom plan to deliver the books to Melrose Elementary. The 12-year-old is excited to share her love for reading with others who normally would not have the opportunity. Opportunities to donate books or funds was open until Hallie’s bat mitzvah date of March 22. For a timeline of Hallie’s progress, check this out. Tags: baton rouge, books, kids need to read, melrose elementary, sternberg. Bookmark the permalink.